This recipe for zucchini cakes is super good. It comes from my KitchenAid Recipe Collection – though there’s not a thing in this recipe that really requires a mixer. At my house this recipe is super great this time of year, because with Lent, Matt & I aren’t supposed to eat meat on Friday, and unfortunately Matt doesn’t like fish or seafood (though he’ll eat popcorn shrimp – probably because it’s almost completely breading). Oh, and he also likes salmon patties, but I don’t like those… Lent is really difficult around here. That makes this recipe a nice substitute for salmon cakes, or something like that. Combine all ingredients (except sour cream and lemon wedges) in the bowl of a food processor or blender; process until well blended. Pour batter into medium bowl and set aside. Heat small skillet over low heat 1 minute, lightly spray with cooking spray. Serve with sour cream and lemon wedges if desired. Hah! I completely understand. My husband hates fish! And the only seafood he will eat is shrimp. Needless to say, we have a lot of vegetarian dishes during Lent. These are yummy. Another variation is to grate 2 small potatoes, rinse them to remove starch and add into mixture. Thank you for the recipe. I’m harvesting a lot of zucchini this week, and trying to find interesting ways to cook it. 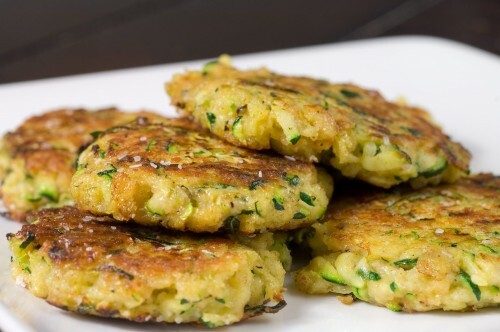 Today I’m trying your zucchini cakes. Yea! I hope you like them. They are out of season here, but I will try to find some at the grocery anyway when lent comes around. Thanks for the excellent recipe. The fritters turned out great. Made a few alterations though. I used chick pea flour in place of all purpose flour. Added some dill (didn’t have parsley) and used red chilli pepper instead of black pepper. Will definitely make this again, maybe with mint or fennel. That’s one of the great things about this recipe. You can easily adjust it to fit your tastes and the ingredients you have on hand. I’m glad you liked them. I would suggest ringing out the zucchini as mine was too runny. I added some breadcrumbs which helped, but great flavour. Thanks! These were so tasty but mine didn’t look anything like your picture does. In your picture they look fatter & fluffy, and a lot less green. Mine were very thin, flat and very green though browned on the outside. They pretty much looked like hell but tasted great. What did I do wrong?! Mine were so runny there was NO way to turn them over. They fell apart and I ended up with zucchini mush (tasty though). Grating zucchini is a super easy process. I use a box grater, similar to this one – http://www.oxo.com/p-542-box-grater.aspx, but you can also use the grating blade on your food processor if it has one – they have small holes in them, similar in design to one of the sides of a box grater. I’m sorry that you feel that way. I believe that all the questions that had been asked on this post were answered, and I’m sorry you had issues with the printing. I’ll look into making the printing easier in the future.